Welcome to the six hundred and thirty-fourth of my blog interviews with novelists, poets, short story authors, biographers, agents, publishers and more. Today’s is with science-fiction and fantasy author Jesse Emerling aka J R Urie. A list of interviewees (blogged and scheduled) can be found here. If you like what you read, please do go and investigate further. Morgen: Hello, Jesse. Please tell us something about yourself, where you’re based, and how you came to be a writer. Jesse: Yes, hello. Well, I am a huge sci-fi & fantasy fan, and was before I could write. I live in Tennessee. In sixth grade, my English teacher had to leave for a meeting, but gave us an assignment to write about anything we wanted, so, I wrote a short story about Indiana Jones on one of his adventures. And I received an A on it. I said I can do this and been writing ever since. Morgen: How lovely. I came to writing in my late thirties and for a while felt I’d missed out but then I had the experience to write about, and it’s great having the resources (the internet) we do now. What genre do you generally write and have you considered other genres? Jesse: Usually sci-fi and / or fantasy, but have considered horror. 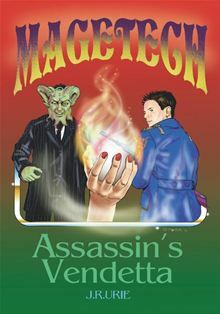 Jesse: So far I have published MageTech: Assassin’s Vendetta under J. R. Urie. Jesse: Yes, the book is available as an ebook on the publisher’s website – Dorrance Publishing, Amazon, and Barnes & Noble. My publisher offered that process for free, but did ask me if I wanted that. In the past, I have read paperbacks, but willing to read ebooks. Morgen: It is great having the choice, and authors tend to be selling more eBooks than pBooks these days. What are you working on at the moment / next? Jesse: Well, right now I am current working on The Balance of the Witch. Jesse: I attempt to write every day. Sometimes, I do suffer writer’s block, but after watching one my favorite movies usually helps. Jesse: It depends usually, but I do try to plot the stories. Jesse: I basically know what the characters look like, but I try to put myself in their shoes to see how they would act or react. Morgen: That must be scary with your horror! Do you do a lot of editing or do you find that as time goes on your writing is more fully-formed? Jesse: Lots of editing even though I find my writing formed fully over the years, but more editing does help. Morgen: I don’t think anyone, even ‘seasoned’ authors write perfect manuscripts without some work. Do you have to do much research? Jesse: Not usually any research unless I need some help on certain parts of the story. Jesse: I mostly write in third person. I never have written in second person, but of course I am willing to. Morgen: Do give it a go. It’s my favourite and although it can be quite dark it might work well in sci-fi / fantasy. Do you write any poetry, non-fiction or short stories? Jesse: I written few short stories, but mostly novels. Morgen: I’m the other way round; hundreds of shorts / flash but just six (not all complete) novels. Have you had any rejections? If so, how do you deal with them? Jesse: I had many rejections, and I kept trying. Morgen: The best thing to do. I like to think it’s just the right thing for the wrong person. Do you enter competitions? Jesse: In the past, I entered a few competitions. Jesse: I don’t have an agent, but I am looking for one. They are not absolutely vital to be successful, but they do help most of the successful writers. Jesse: I try to do as much as marketing I can within my budget. Morgen: At least by using the likes of LinkedIn, Twitter and Facebook you can do a lot for free. What’s your favourite / least favourite aspect of your writing life? Has anything surprised you? Jesse: My favorite of writing part is creating characters and places or the world. The least favorite is the time consuming of writing. A surprise is how much people like my novels. Morgen: I like that. We write to be read, don’t we. What advice would you give aspiring writers? Jesse: Do not quit and keep trying. Jesse: George Lucas, Frank Hebert, and Gene Roddenberry. I do not know what to cook, but something that everyone would like. Morgen: A buffet perhaps, then you please everyone. Is there a word, phrase or quote you like? Jesse: I’m ain’t right, but I am fun. Morgen: I have a badge quoting Haruki Mirukami saying, ‘I’m not so weird to me’. I like to write dark stuff. 🙂 What do you do when you’re not writing? Jesse: Watch movies and gardening. Morgen: I like to garden when I get out there. It’s finding chunks of time I struggle with, although it’s like writing; when I need to find the time, I find it. I love the movies and one of my lodgers and I have season tickets to the cinema. The other lodger joins us at home every Monday and Wednesday night for a movie. It’s the only time I sit and do nothing. Are there any writing-related websites and / or books that you find useful? Jesse: Facebook, it is very valuable. You can get fans and awareness. Morgen: Isn’t technology wonderful. What do you think the future holds for a writer? Jesse: It can be bright for any writer. Jesse: It’s at Dorrance Publishing site, on Amazon.com, and Barnes & Noble.com. I also have a page on Facebook where I keep everyone inform on my progress in interviews, books, and general news. The capital city, Verton, had just fallen into an intense spell of winter as the coldness and brisk air settled in from the South. There was an impervious stale, clayey smell in the frosty air tainted lightly with virulent sulfur as the disgusting smell could ripple anyone’s nose. The weather expected to be cold, Mallory had to wear at least three cheap wool jackets and two pairs of synthetic cotton pants to keep warm from the chilly air that held his breath freshly and firmly before him. He had short brown hair with a considerable touch of gray, sparkling hazel eyes, and was six feet tall and muscular with a small, swollen gut. He was a man who picked newly grown crops at a food produce factory from where he had just gotten a ride by one of his fellow coworkers. The crops flourish magically by energy cells, known as ECs, from the Energia factory across the north end of the city. The energy cells assimilate continuously from within the planet’s core. For picking crops, the pay wasn’t exactly good, but it did feed the family—his wife, Dorrv; his two daughters, Adella and Delilah; and his son, Matherion. After a day’s work of picking the freshly grown crops, he marched up the semi-rotten wooden steps to a small apartment on the third floor, with about less than four hundred square feet of area, in a run-down building. The rotten wooden steps of the stairs squeaked and creaked under his feet as high-rise buildings filled his entire vision all the way to the viewpoint. The walls of nearby high-rise buildings plastered with brick resembled stone from the prehistoric days. Every time a lustrous mobi went by him, there was an electrical humming sound from the energy cells generating power. On the way up the worn wooden steps, a Verton-Titro`en limousine parked on the terrace on the other side of the airpathway. The terrace was a long, tiled, concrete walkway with chipped and cracked orange tiles and a steel alloy railing, resembling a balcony. It was covered with rubble, grainy dirt, plaster powder, rotting wood pieces, and broken platiglass.